Import tgz to Magento 2. Now, let’s take a look at how people import archived data to Magento 2 most frequently. Let’s imagine that you’ve just downloaded a .zip file from the Internet to run Magento 2 product import using the Terminal. Unfortunately, it is not possible to import a .zip file into Magento 2 directly. The same is about tar, tgz, and other archive data formats. Thus, you have to unpack the file manually. Now, you can take the unpacked product file and import it into your Magento 2 store. The only positive aspect of this approach is that it enables the Magento 2 import for compressed data. You still have to edit data files to make them suitable for the Magento 2 import attribute values. As you can see, so many difficulties prevent you from running the seamless Magento 2 import. What alternative do we offer instead? And you don’t need to extract either of these files to update your e-commerce store. The Improved Import & Export Magento 2 extension will do that for you. Create a new import profile and start the update – that’s the only thing you should do. Let’s take a look at positive aspects of importing archive data files to Magento 2 with the help of the Improved Import & Export extension. Avoid converting compressed data files to formats suitable for Magento 2 – our module offers broad support for different standards. Perhaps, the only negative aspect of the alternative way of importing archive data files to Magento 2 is the necessity to install a third-party tool, but let’s be honest: the barebone version of Magento requires improvements so that installing additional modules is a quite common procedure. Now, when you know that the Improved Import & Export Magento 2 extension offers a user-friendly approach to the import of compressed data files to Magento 2, we should pay separate attention to its core features designed to improve your daily admin duties. There are two blocks of features that improved the default Magento 2 import. Firstly, we want to concentrate on the advanced usability enhancements provided by the Improved Import & Export extension from the perspective of the Magento 2 archive data import. Secondly, we will describe the extended connectivity options of the module that also simplifies the Magento 2 import of compressed data. This chapter describes two features: schedules and mapping. In a combination with the ability to import compressed data, they dramatically simplify your daily routine by making it possible to automate data updates. Let’s take a closer look at what Improved Import & Export offers. Our extension supports cron allowing you to create any custom schedule of updates. Use the default cron syntax to automate the import of compressed data files into Magento 2. At the same time, you can select one of the predefined intervals which are fully customizable as well. Alternatively, the Improved Import & Export Magento 2 extension offers the ability to create import profiles designed for a manual run only. For instance, you have a partner who sends data archives infrequently so that you cannot create a corresponding schedule to import them on a regular basis. A manual import profile will be fully suitable for solving that issue. At the same time, the Improved Import & Export Magento 2 extension provides the ability to launch every profile in an asynchronous mode. This feature is especially helpful when a data file is not provided according to a timetable but the update is urgent. Simply import the information whenever you need without waiting for the scheduled event. Another feature that lets you fully automate Magento 2 import processes and archive data files uploads is mapping. It’s not a secret that different platforms have a different approach to the way data is represented within the system. Therefore, you should edit the external output to make it suitable for the native Magento 2 import attribute values. The procedure is boring, time-consuming, and requires tons of patience and attention. However, you can avoid it with the Improved Import & Export Magento 2 extension. Our module provides the ability to match external attributes to the internal values of Magento 2 in a very user-friendly way right in the extension admin. The process is called mapping and it is a one-time procedure – not a repeatable action like in case of native Magento import tools or most third-party modules. Repeat the aforementioned steps for every update. Save and run the profile. Please, contact our support regarding mapping presets for your particular business case. Leave your requests here: Firebear Help Center. 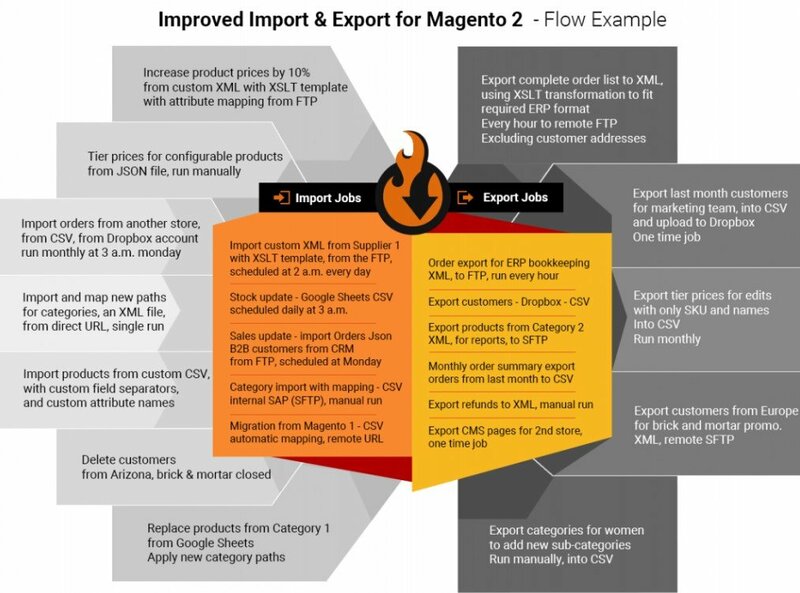 The extended connectivity options of the Improved Import & Export Magento 2 extension are also worth mentioning in the context of compressed data import. Let’s take a look at supported file formats and sources. No matter what archive data formats are supported if the platform works with a single format of the archive content. Let’s imagine a situation when Magento 2 starts supporting compressed data for import processes but works with CSV only. Thus, in case the content of provided archives is XML, you still have to unpack them because XML files are not supported by the platform. In this situation, support for archive data files is absolutely useless. To prevent a similar situation, the Improved Import & Export extension offers the extended support for various file formats. In addition to default CSV, it also works with XML, JSON, and OSD. It means that you can import data in these formats in a form of zip, tar, and tgz archives. Also, note that native Excel files – XLS and XLSX – are utilized for internal purposes. When it comes to data file import, it is also worth mentioning a broad variety of supported file sources. Firstly, the Improved Import & Export Magento 2 extension offers FTP/SFTP support allowing you to import data archives to Magento 2 from a local or remote server. Secondly, you can use Dropbox for the same purposes. 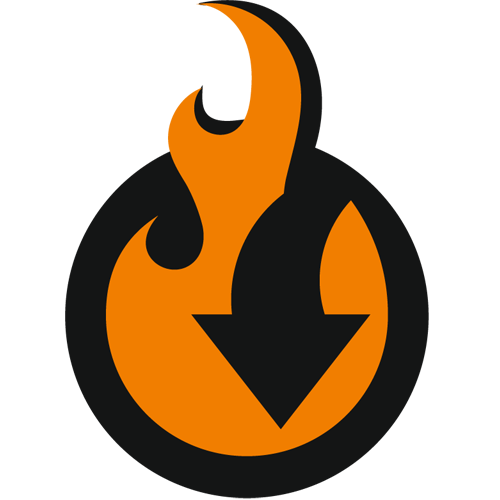 Thirdly, the module supports direct URL uploads! Import files in multiple formats.